Oops. US retailer Best Buy has gone over Google's head by posting the new Nexus 7 2 tablet on its site before the search giant has had a chance to actually launch it. The new Nexus 7 popped up for pre-order with a full list of specs and numerous images showing the slate from pretty much every angle. 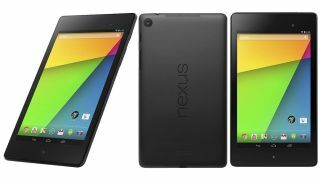 We've seen a lot of the details in previous leaks, but this listing now confirms to us that the Nexus 7 2 will arrive with an updated version of Google's Jelly Bean OS - Android 4.3. There's good news in the display department with the 7-inch IPS screen now sporting a full HD, 1920 x 1200 resolution - up from the 1280 x 800 offering on the original Nexus 7. Rumours suggesting Asus, the manufacturer behind the Nexus 7 2, would ditch Nvidia as the processor supplier for the new tablet seem to be correct as Best Buy lists Qualcomm's 1.5GHz quad-core Snapdragon S4 Pro chip, with 2GB of RAM and an Adreno 320 GPU backing it up. In terms of internal storage it looks like things haven't changed on the new Nexus 7, with 16GB and 32GB models appearing on the retailer's site - and sadly there's no mention of a microSD slot. Design wise Asus has slimmed down the new Nexus tablet, and smoothed out the rear - although it appears to be slightly taller than its predecessor. According to the pre-order listing the Nexus 7 2 measures 200.7 x 114.3 x 7.62mm, making it thinner than the original, but still not a svelte as the 7.2mm iPad Mini. Asus has also managed to make its latest tablet lighter with the new Nexus tipping the scales at 318g (11.2oz), compared to 340g (11.99oz) - but once again the larger-screened iPad Mini still rules the roost at 308g (10.86oz). The standard array of connectivity options are also on board including a microUSB port, Wi-Fi b/g/n, Bluetooth 4.0 and GPS - no sign of NFC or a HDMI output though. Cameras on tablets are still a little questionable, but the new Nexus 7 is set to rock up with a rear-facing 5MP snapper as well as a front facing 1.2MP cam for video calls. When it comes to pricing the 16GB Nexus 7 2 is up for pre-order at $229.99 (around £150, AU$250), while the 32GB model is $269.99 (around £175, AU$290). This would make the new Nexus 7 a touch more expensive than the current version and while that may be disappointing for some, it's still pretty cheap in the grand scheme of things. There's no sign of a new Nexus 7 2 release date on the Best Buy site however, so it's still not clear when the tablet will actually land in laps. Google may shed light on this later today though, as it has a little meeting organised where we expect to see Android 4.3 rolled out along with the new Nexus tablet.